Designed to work together but will also operate as separate packages on individual computers or networked system. TRANSMILLE, represented by Scientific Devices Australia , has released new versions of its calibration software. ProCal V3 is a package used to calibrate instruments manually or for full closed loop calibration via IEEE 488/RS232/USB interfaces. ProCal-Track 3 is management software that controls the complete management process within a calibration laboratory from the customer through transit, goods inwards, calibration and back to the customer. Both ProCal and ProCal-Track are designed to work together but will also operate as separate packages on individual computers or networked systems and are compatible with Windows 98/NT/2000/XP. The software can be easily translated into any language, including reports and certificates. Standard certificate formats, including company logos, are available. Full support for Seagate's Crystal Reports is available as an option, allowing seamless integration of user-generated reports and certificates. Exporting or importing data to other commercial packages via SQL is easy. The user can add any reference, in any discipline, and uncertainty templates are created or added for any type of operation and for any type of uncertainty distribution. The software then automatically calculates the total expanded uncertainty for the measurement, even for manual measurements where the technician assesses and enters the noise or flicker, conforming to M3003 (UKAS) and ISO 17025. Externally calculated uncertainties can be entered if desired. Although principally designed for electrical calibration, ProCal can be used in any discipline. It can be used with Transmille's 2006A, 2041A, 2050 and 2100 multi-product calibrators and also supports calibrators such as Wavetek/Datron, Fluke, and Druck. Other references may be introduced. Multiple references may be used simultaneously in more complex calibration systems. 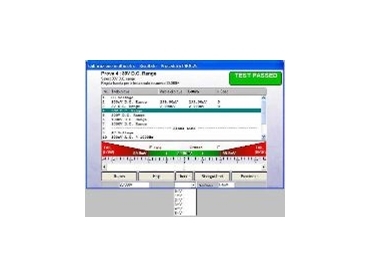 ProCal's Procedure Wizard allows the user to write specific procedures in a few minutes with full cut, copy and paste facility, even for full closed loop operation via GPIB/RS232/USB instrumentation. A technical help file for the specific model is available at all times during procedure operation. Full graphic capability is available, including digital video for more difficult operator requirements. ProCal-Track provides a total solution to the management/tracking process required by both commercial and in-house calibration laboratories working to ISO 9000/17025 regulations.